Beware: Dubai Financial Services Authority Scam! 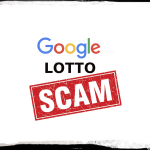 For whatever reason, the people who orchestrate any kind of lottery scam always seem to go for the magic number of $1 million USD as the “prize” money. The latest scam that uses this amount is the DFSA Emirates Lottery Foundation. 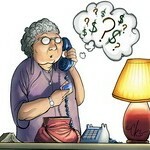 According to the DFSA website, the scam uses falsified documents that are supposedly issued by the DFSA. 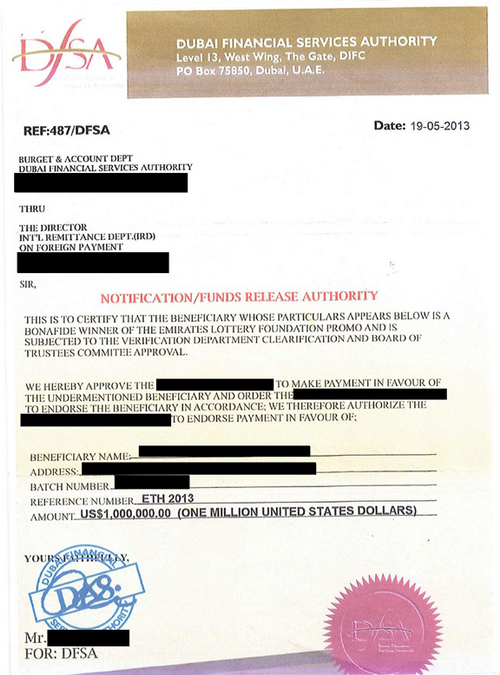 The orchestrators claim that the person who is named in the documents is the winner of $1 million USD (isn’t that surprising) and the funds come from the Emirates Lottery Foundation Promo. 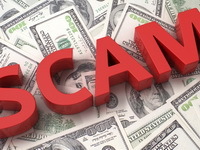 The scammers use the logo and the name of the foundation—they even went as far as using the signature of a former employee of DFSA to draw more attention to the scam. • The “Emirates Lottery Foundation Promo” is non-existent in Dubai or the United Arab Emirates. • DFSA does not participate in lotteries, nor does it approve of transfers of lottery monies. • The DFSA does not issue a fee in relation to any transferring of monies. 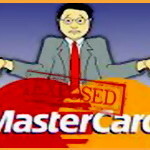 • The signature and name of the former DFSA employee are being used without permission by the individual. This is not the first instance where the Dubai Financial Services Authority has been associated with. In October 2013, there were instances where fraudulent emails were circulating, supposedly sent by the Dubai International Financial Centre governor, Abdullah Saleh and DIFC member Hussain Al Qemzi. These emails, though not associated with the lottery, stated the DIFC wanted to relocate and conduct business outside of Dubai. The emails offered to provide financial assistance for projects in private sectors located outside of the Arabian Gulf. The projects had to utilize a five-year “renewable” loan whose interest rate had to be three percent. There was another scam which was sent from a Gmail address that was supposed to be from Al Qemzi. These emails claimed that the recipient of the email was able to take out a $50 million loan in the form of 10 year-renewable loans with an interest rate of six percent. Those who were interested in the loan were asked to pay an initial fee of £5,500 (Dh32,471) to begin the loan process. It never ceases to amaze me how creative people will get when they want to swindle others. It is always a good idea to be skeptical whenever you receive an offer that is too good to be true, even if it looks legitimate. If you are ever in doubt, simply discard the correspondence—or report it to the appropriate authorities. You’ve Got Mail? Put It Here!